What goes into creating a convention adventure for Wizards of the Coast? Why do Vault of the Dracolich and Candlekeep have different styles? How did a battle interactive come to replace a delve? 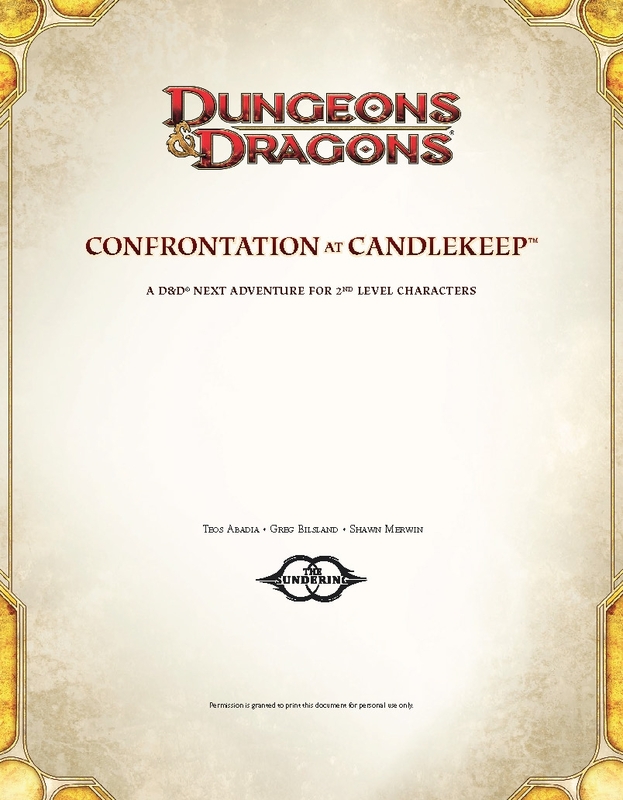 How well does RPG historian Shannon Appelcline capture Candlekeep’s process and history? I aim to answer this and more in three articles this week. I also draw parallels to 1980s, showing the history of organized play experimentation. This is the second article in the series. True, there had been tournament modules before, but we wanted a great experience from beginning to end, with a story and characters that carried all the way through. – David “Zeb” Cook, in the 2013 forward to Against the Slave Lords, looking back on the 1980 adventure series. Vault of the Dracolich was a big influence, but in writing Confrontation at Candlekeep we also had our own unique vision and goals. 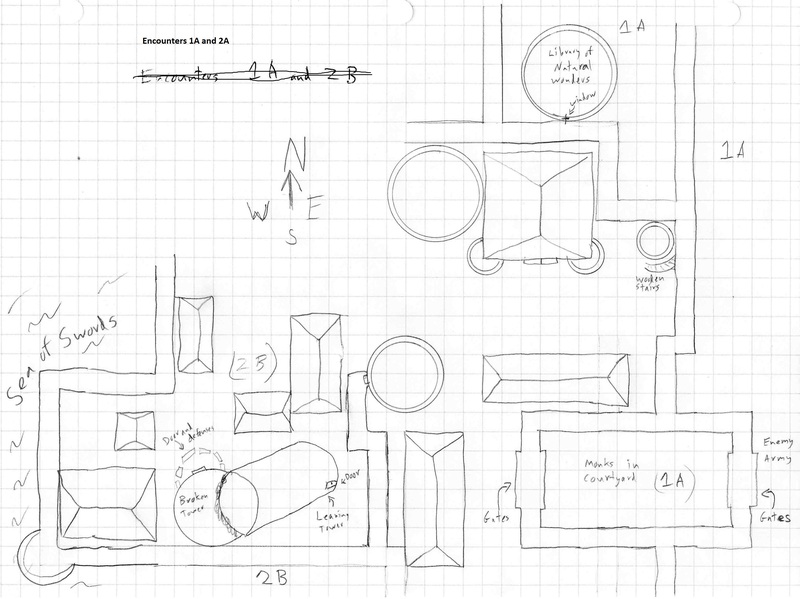 Shawn Merwin and I were assigned Candlekeep in February of 2013, likely just after Vault’s internal playtest. Candlekeep had a similar vision of creating an exciting event that would bring tables together and create a lasting impression. Unlike Vault, the initial vision didn’t call for it to be particularly challenging. It was a tremendous success at Gen Con and PAX Prime 2013, prompting WotC to run it at PAX East 2014. It also ran at a multitude of smaller conventions, including at SakuraCon 2014 with Matthew Mercer (voice actor and D&D fan) acting as First Reader. Wizards seems fond of the adventure. Peter Lee was kind enough to say it was his favorite time playing D&D. Greg Bilsland has run it for multiple groups at house parties. WotC staff members have taken it to conventions. Katy Laurence wrote about running it for a birthday with friends. The event was the first playable event for the Sundering, the cataclysm that again separated the Realms (Toril) from its twin world (Abeir). Candlekeep ties into the 6th Sundering novel, The Herald, by Ed Greenwood. In the adventure, the players are the many people of note that at a given time happen to be visiting Candlekeep. When forces of Asmodeous strike (seeking a book of great power, though that happens off-screen), the monks ask the PCs to recover ward-stones that can raise a magical shield to seal off Candlekeep from the world. There were many initial ideas on how to tie the novel into the adventure, including having Ed Greenwood issue daily battle reports or tracking results from each table and changing encounters each day. We also considered special missions, where some tables might decide to take on a special agent of Asmodeous in a highly challenging fight, with the success or failure impacting play. It was hard to marry the thrill of that concept with the hard realities that occur when tables overextend themselves or when a few expert players force new players to get in over their heads. These kinds of challenges can also be highly DM dependent or feel adversarial. In the end, these were complications that didn’t add to the most important part: the experience the players would have. They also would have ballooned our word count, which was very tight, while making DMing more complicated. Wizards did create a cool map, which was printed for Gen Con and used by DMs. Working with Shawn Merwin is fantastic. I look up to Shawn as one of my mentors. He is one of my utmost favorite writers, has a storied history with organized play, is really wise when it comes to RPGs, and he’s one of the nicest people you will meet. To top it all off, he trusted me with my first 2009 Gen Con writing assignment (I’ve been fortunate to write something for D&D at every Gen Con since 2011! Look what you did, Shawn!). Working with Shawn is always a great learning opportunity and it was a lot of fun to exchange ideas with him on this project. Greg Bilsland is a great producer and welcomed our ideas and changes. His passion for making D&D better is always present. He also trusted us when we shared our experience of interactive elements that might not work well and our alternate suggestions. As you will see, he also added his own fantastic changes as our developer on the project. One of the treats of the project was getting to trade e-mails with Ed Greenwood! He shared some of Candlekeep’s lore, and his e-mails very much sound like words from a sage (pssst: he’s Elminster!). We also received some overview material from Wizards. I read through several sourcebooks, skimmed three novels, and spent time on the repository of lore that is Candlekeep.com. In all, the funny thing is how little tangible pertinent canon there really is on Candlekeep. Some buildings are described in broad terms, but there was really very little to establish what PCs would see. Of note, Ed explained that the idea of a forest of towers so plentiful that no monk knew them all was not part of his original vision, added by a single writer and forever changing the canon. Much of the keep’s layout was my own take (or Shawn’s), expanding upon the crude map from the Baldur’s Gate video game and a bit of lore. We tried to use locations that existed, but we also added our own, such as my broken tower. 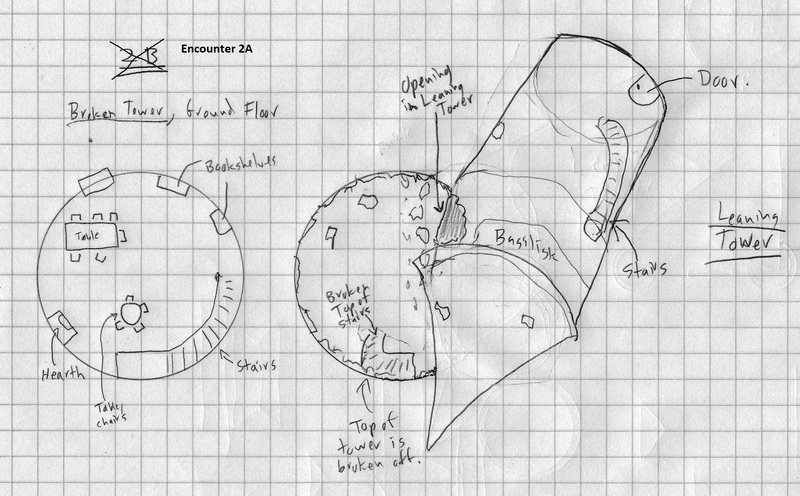 My skills do not include map-making or drawing, as you can see from my sketches. In part to help DMs and players, before Gen Con 2013 I discussed Candlekeep’s location and importance in the Forgotten Realms. Next: We discuss the interactive elements, which were a huge key to the excitement of the event. This entry was posted on November 4, 2015 by Alphastream and tagged 5E, Authoring, Conventions, Forgotten Realms, Gen Con, RPG History.